The countdown has started for “The Contender Special â€“ Put Up or Shut Up” on October 14, newly signed under promotional outfit with The Contender, Jerson “SuperJerz” Ravelo will fight Allan Green in 8-round co-feature, on ESPN2 from the Dunkin’ Donuts Center in Providence, Rhode Island, headlined by The Contender I star Peter “The Pride of Providence” Manfredo, Jr. against Providence cross-town rival Joey “KO Kid” Spina. In the zone, super middleweight contender Jerson “SuperJerz” Ravelo, ready to add to his winning repertoire, will encounter Allan “Sweetness” Green, in their highly anticipated 8-round co-feature. Ravelo (17-1, 12 KOs), the 2000 Dominican Olympian who holds an amateur win against former world champion Jeff Lacy, now rated No. 5 by the World Boxing Foundation, No. 9 by the North American Boxing Federation and No. 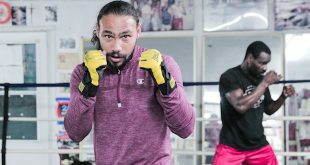 10 by the World Boxing Organization, United States Boxing Association & North American Boxing Organization, plans to steam roll his way to the top. Green, however bitter and arrogant, is upset that he hasn’t gotten a high profile or world championship fight, yet. Plans to take on the super hot Ravelo, coming off three straight wins by way of 1st KOs, vows to defeat him. 12-round main event versus Providence archrivals Peter “The Pride of Providence” Manfredo and Joey “KO Kid” Spina will host no love. Manfredo (25-3, 11 KOs), rated No. 14 by the World Boxing Council and No. 15 by the International Boxing Federation, was a finalist in the original season of The Contender. 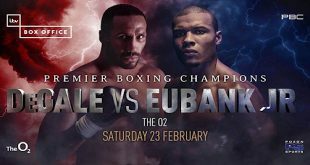 The former NABO super middleweight title-holder plans to embarrass Spina in front of their families and friends at The Dunk. WBC USNBC and IBF Intercontinental super middleweight champion Spina (19-0-1, 14 KOs), now rated No. 14 by the IBF and No. 16 by the WBC, has promised to knockout his former Providence neighbor Manfredo in the middle of the ring with all their supporters watching. Also featured on this card in a Special Light Middleweight Attraction is The Contender I favorite Alfonso Gomez against Juan Pablo Montes de Oca. 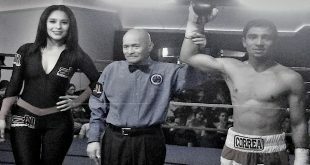 The Mexican-born Gomez, now fighting out of (Whittier) California, is rated No. 7 by the NABF. The fights will be televised on ESPN2 from 10:30PM â€“ 12:30 AM/ET. It will be tape-delayed as the main event will begin LIVE at 9:00 PM/ET inside the Dunkin’ Donut Center. 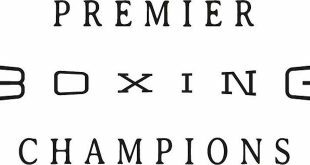 On the undercard against opponents to be determined are three Rhode Island fighters â€“ Pawtucket light welterweight Eddie Soto (5-0, 4 KOs), Providence lightweight “Hammerin’” Hank Lundy (2-0, 1 KO) and Pawtucket featherweight Jose Sanchez in his pro debut. The Tournament of Contenders is promoting “The Contender Special â€“ Put Up or Shut Up” in association with Classic Entertainment & Sports. The promoters hope to parlay the success of the recent finale of The Contender 2 series at the Staples Center in Los Angeles, which drew more than 12,000 fans and earned a 1.9 rating on ESPN, representing more than 1.7 million house holds and 2.3 million viewers. It was the highest rated boxing telecast on ESPN in nine years dating back to January 1, 1997. Tickets priced at $57.00, $152.00, and $302.00 (ringside) are on sale through www.Ticketmaster.com, all local Ticketmaster outlets or by calling Ticketmaster direct at (401) 331-2211 or (617) 931-2000. Tickets are also available through CES Boxing at (401) 724-2253, www.cesboxing.com and the Dunkin’ Donuts Center Box Office. For more information on Jerson Ravelo, visit www.myspace.com/jersonravelo. For information on “The Contender Special â€“ Put Up or Shut Up”, visit www.tournamentofcontenders.com, www.cesboxing.com or www.dunkindonutscenter.com. The Contender is an unscripted drama about the lives, fears and hopes of 16 professional boxers as they compete for the chance to change their lives and the lives of the people they love forever. The Contender 2 season culminated this week under the ESPN Original Entertainment (EOE) banner and executive producers Mark Burnett (Survivor, The Apprentice, Rock Star: INXS), Jeffrey Katzenberg and Sylvester Stallone. Launched in 2001, ESPN Original Entertainment is ESPN’s award-winning original programming banner. The EOE brand spans ESPN's sports-themed original movies, scripted and unscripted dramatic series, daily talk and debate series, documentaries, game shows, groundbreaking televised events such as the X Games and The ESPYS, and is delivered across multiple media platforms. With theatrical releases such as Through the Fire about basketball phenom Sebastian Telfair and Once in a Lifetime about the 1970’s New York Cosmos, as well as The Impossible Jump where motocross champion Mike Metzger performed a motorcycle backflip over the Caesar’s Palace fountains live in Las Vegas, EOE continues to plant itself firmly on the cutting edge of sports and entertainment television, and event creation. Also, EOE's daily lifestyle and entertainment-themed series Cold Pizza and Quite Frankly are cornerstones of ESPN2’s programming lineup. With many new scripted and unscripted projects in development, EOE serves both the passionate sports fan and the more casual viewer, and strives to expand ESPN's already industry-leading offerings in live events and sports news & information programming. influential people in the world today.